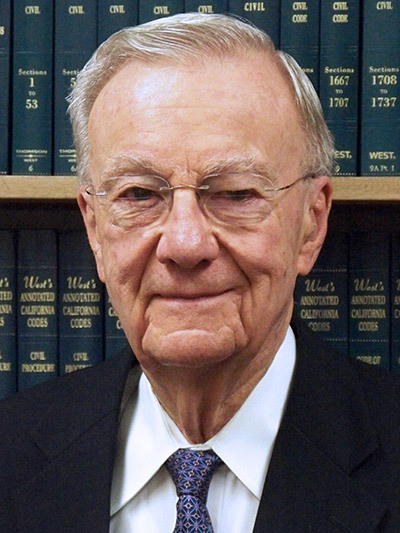 Since establishing his practice in 1952, Bob has handled many areas of the law. His most recognized contributions to the community occured during the 1970s and 1980s when he was a co-founder and attorney for the Napa Valley Bank and advised its holding company and subsidiaries. During this 20 year period, he also participated substantially in formation of wineries and represented growers and vineyard management companies. Bob was the founding president of Justin-Siena High School Board of Trustees and Justin-Siena High School Foundation. He served as president from 1972 to 1989. Upon his retirement, a building on campus was named the Zeller Building. All six of Bob’s children graduated from Justin-Siena. Bob finds great reward in relieving his clients of their stress by solving their legal issues. Sixty-five years later, devoted and tireless, he continues to enjoy his work and the relationships he has formed. Bob was married to his wife, Inge, for 65 years until her death in 2016. Together, they have six children, fifteen grandchildren, and four great-grandchildren.